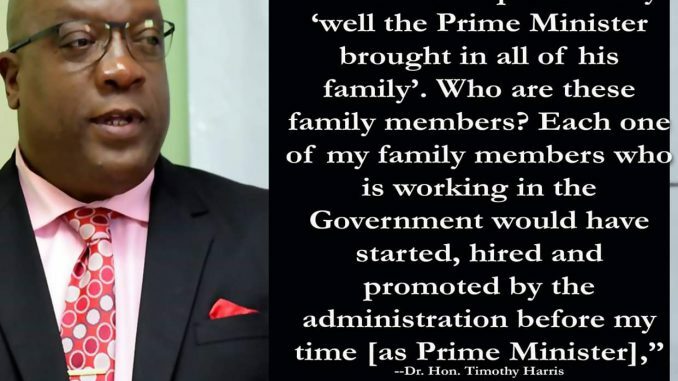 Basseterre, St Kitts, April 11 2019 – In the face of mounting evidence, St Kitts and Nevis’ Prime Minister Dr the Hon Timothy Harris continues to lie to the people of St Kitts and Nevis that he is not guilty of nepotism. At a press conference on Tuesday, Dr Harris repeated the lie that he has not appointed members of his family including sisters, brothers, nieces and nephews to the present positions that they presently hold since he became prime minister in mid-February 2015. Dr Harris in an interview with Jerry George in St Vincent and the Grenadines on the weekend said “there is not a scintilla of evidence” that he is guilty of nepotism and at his press conference repeated the lies to the press and general public, although the evidence exists in official documents. Another Official Gazette, Vol CXI of 28 July 2016, No 37, page 2, noted that his niece, Delcia Mills-Blaize was appointed as Senior Clerk, Office of the Minister with effect from 1st April 2016. Ms Mills-Blaize was a Clerk in the Department of Labour when Dr Harris assumed the position of Prime Minister in February 2015. Shortly after, she was transferred and appointed as Senior Officer in his office. Prime Minister Harris also told Jerry George and repeated at his press conference that all of his family members were appointed under the previous St Kitts-Nevis Labour Party administration led by former prime minister the Rt Hon Dr Denzil L Douglas.